Think Kent, think crunchy apples, aromatic hops and juicy cherries. We aren't known as the Garden of England for nothing! BUT, did you know that the climate, soil and landscape makes our corner of England a fine spot for luscious, green grass too? And of course where there's top quality grass, cows are healthy and happy and the richest, creamiest milk flows! Of course, like everything else in the Garden of England, the quality of our produce is only half the story. It's the artistry, dedication, innovation and (dare we say) love of our farmers, our dairies and our artisans, that adds the magic and turns that wonderful milk into rich and intense cheese, indulgent and velvety ice-cream and silky, oh-so-healthy yoghurt. There are some cracking discoveries to be made that are keeping our dairy industry sustainable whilst making the products even better for you to munch, lick, slurp and otherwise enjoy to your heart's content! So forget (just for a moment) the orchards, hop gardens and vineyards and come and explore our beating grassy heart. 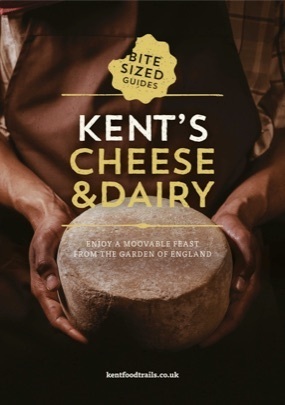 It's time to feel the love (and the craft) in the crème de la crème of Kent's local produce.